This whole being without electricity is not fun. I never imagined the Blackberry would be my emergency communication conduit to civilization, but that's what it's been. More about that in a minute. 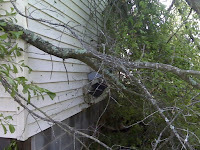 Friday night, we knew that the storm has set a tree against the house. But, being dark and all, I couldn't get good pictures. Saturday, though, I was able to get a great view of the tree ... from the bathroom. Not a view I recommend. Outside, though, we could tell a bit more about things. I've never seen the bottom of a tree before. Well, not one this size. Growing up in southeast Georgia, we got some storms. Tornadoes would sometimes hit the area. Heck, turn on TV and watch the news crews anytime a series of storms hits. They are in the south, and talking to somebody who's "1 green, 1 brown." That refers to their socks, their eyes, and their teeth. Yeah, we wuz just sittin' there when it sounded like this freight train come through. Got us thinking 'bout my Boxcar Willie 8-tracks. Then, alluva sudden, the winders busted in, and next thing I knew, I was sittin' underneath the dually. That's not quite what it was like for us, of course. But still, growing up in areas frequented by tornadoes and hurricanes (and hurricane-spawned tornadoes), I'd seen big oak trees uprooted before. But never up close. And never in the back yard. The tree wasn't quite horizontal. The house broke its fall. The limbs caught the edge of the house, and did damage there. Broke through the roof, letting the rain in. Got water stains in the bathroom. But no actually breaking through the ceiling. Knew that Friday night, after the worst of the storm passed. After everyone left -- oh, I didn't mention that, did it? Right after the tornado did its little part, the family nearby loaded up in their pickups and came over to the house. Seems the storm was upsetting folks, what with all that loud racket that sounded like a tornado, and the lights going out, and the thunder and lightening and all. So, they came over to our house, where it was safe. 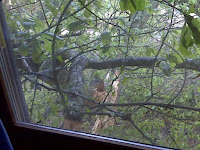 Of course, our house was the only house in the immediate area with a tree on it. So, I'm still trying to figure out what passes for "safe" around here. But, I'll learn, I'm sure. Anyway, after everyone departed, the flashlights finally gave out. Don't know how old the batteries were, but they died. So, in order to do a walk-though of the house, I had to use the only light I had: the screen on the Blackberry. If you open up "Contacts" or "Messages" you get a mostly-white screen. And that can be used as a bit of light. Not a lot of light, but, after being in the pitch-black dark for a while, it's actually useful. The walk-though showed no limbs through the ceiling or anything. Did see what looked like a slight discoloration, as if an area of the bathroom ceiling was damp. It was. The next morning, we could see why. 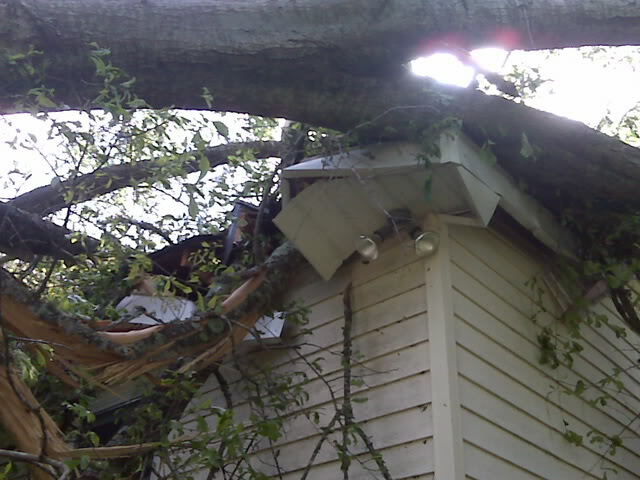 What with the tree sitting partially inside the roof. We could also see why the lights went out. 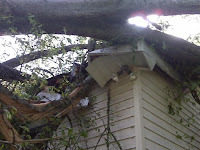 The tree, although it's downward path was obstructed by the corner of the roof, was large enough so that its limbs extended the 10 or so yards from the house to the power pole that runs through the yard. Limbs were on the lines there. 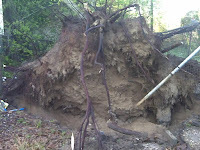 Oh, and the limbs between the main trunk (sitting on the house) and the peripheral limbs (sitting on the power lines)? Well, that little line that runs from the power line to the house ... no longer runs from the power line to the house. No, it sits on the ground. And, in order for that to happen, the power meter and box had to go. 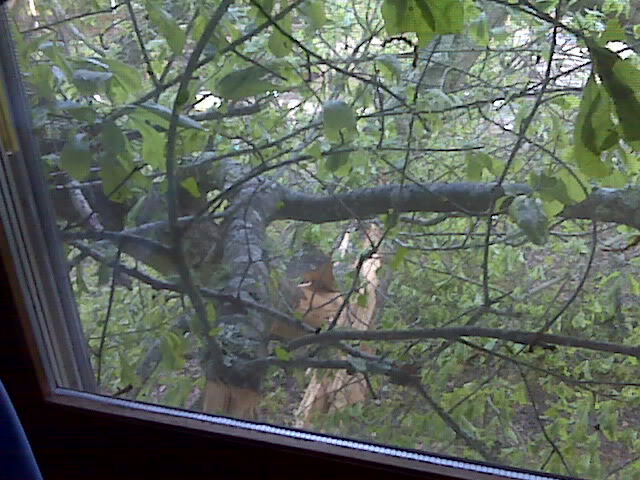 So, the tree took it out, too. When the lights went out, the TV stopped playing. It does that. I had no idea if the cable went out, or just the lights. But, Saturday, it became obvious. The power box was right above the cable box. Cable's that black thing in the photo. The black thing that's hanging off the wall. Oh, and that gray thing below it? Telephone box. Which means, like I said Friday, "no phone, no lights, no Internet, not a single luxury." And, of course, the local hotels where we're staying, so we can wash, sleep comfortably, and such. Today, it's off to Electrician Land to find an electrician. 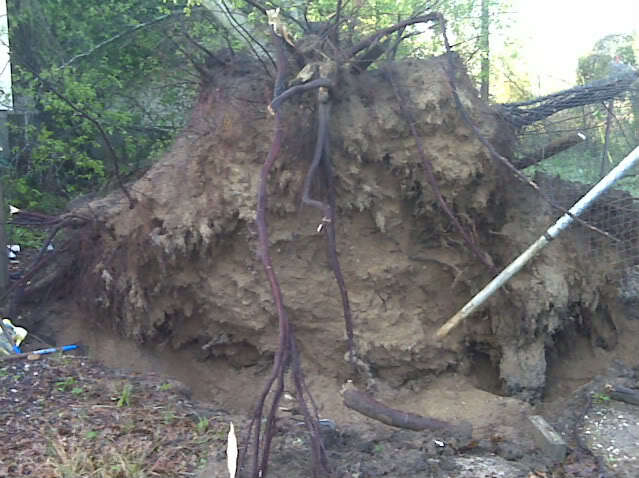 Got to get that power box back up, so the power company can get us power back to the house. I've got stuff on the TiVo I still haven't watched. At least I got my priorities straight, huh? Thank the Lord you and your wife are safe! Funny that you should have a preview of what life will be like for all of us once the Obama energy policy has a chance to take hold. Very Happy You are Safe! Sorry about your house, glad your're okay. Hope you get everything at your house up and working soon! Just imagine if you had to live that way--I don't think I am pioneer stock! Good luck!